To turn on the camera, tap the Camera Button. The camera turns off automatically after 5 minutes of inactivity. To turn off the camera manually, tap the Camera Button and the Phone Button simultaneously. Press and hold the Camera Button for 1 second to start video recording. The green LED will flash and you will hear a voice prompt, “Recording”. Press and hold the Camera Button for 1 second to stop recording. You will hear a voice prompt, “Recording stopped”. 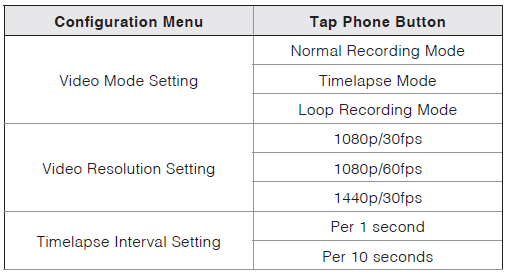 Below is a table of approximate video recording times to microSD card size in specific resolutions and frame rates. MicroSD cards up to 64GB are compatible. Using a Class 10 microSD card is suggested. Your microSD card needs to be formatted using the camera. The camera gives a warning and automatically stops recording when the microSD card is full or the batter y becomes low. The maximum size per video is limited to 4GB. Therefore, when the video reaches the 4GB size limit during recording, it saves and creates a new video to continue recording. Loop Recording mode continuously records videos to create footages of assigned length of time. If the memory reaches maximum, then the oldest footage will be deleted to store the most recent footage. To take a single photo, tap the Camera Button to take a photo. The green LED will flash and you will hear a shutter sound. The camera resolution is fixed to 3.7MP with 16:9 aspect ratio. However, when you take a photo during video recording, the photo resolution is the same as the video resolution. 1. Press and hold the Phone Button for 5 seconds until the LED flashes red and blue alternately and you hear multiple beeps. You will hear a voice prompt, “Phone pairing”. 2. Search for Bluetooth devices on your mobile phone. Select the Sena 10C Pro in the list of the devices detected on the mobile phone. 1. Press and hold the Jog Dial for 5 seconds until the red LED flashes rapidly and you hear a voice prompt, “Intercom pairing”. 2. Within 2 seconds, tap the Phone Button again, then the LED flashes blue rapidly and you will hear a voice prompt, “Second mobile phone pairing”. 3. Search for Bluetooth devices on your GPS. Select the Sena 10C Pro in the list of the devices detected on the mobile phone. 4. If your GPS asks for a PIN, enter 0000. 3. Search for Bluetooth devices on your mobile phone. Select the Sena 10C Pro in the list of the devices detected on the mobile phone. 1. Press the Phone Button for 5 seconds until the LED flashes red and blue alternately and you hear multiple beeps. 2. Within 2 seconds, tap the Phone Button again, then the LED flashes blue and you hear “Phone selective pairing”. 3. Search for Bluetooth devices on your smartphone. Select the Sena 10C Pro in the list of devices detected on your phone. 2. Within 2 seconds, tap the Jog Dial again, then the LED flashes red and you hear “Media selective pairing”. 1. Double tap the Phone Button and you will hear a mid-tone single beep and a voice prompt, “Speed dial”. 2. Rotate the Jog Dial clockwise or counter clockwise to navigate between the menus. You will hear prompts for each menu item. 4. After selecting the last number redial menu, “Last number redial”. Then, to redial the last phone call number, tap the Phone Button. 5. To call one of the speed dials, rotate the Jog Dial clockwise or counter clockwise to navigate between the menus until you hear a voice prompt, “Speed dial (#)”. Then, tap the Phone Button. 6. If you want to exit the speed dial immediately, rotate the Jog Dial until you hear a voice prompt, “Cancel”, and tap the Phone Button or the Jog Dial. 1. To answer a call, tap the Phone Button or the Jog Dial to answer the call. 3. To end a call, tap the Phone Button or press the Jog Dial for 2 seconds until you hear a beep. 6. To make a call with voice dialer, Tap the Phone Button in stand-by mode to activate the voice dialer of your mobile phone. If you have a mobile phone and a GPS connected to your headset, you may not be able to listen to the GPS voice instruction during the phone call. second during an intercom conversation until you hear a double beep. Press and hold the Jog Dial for 1 second to end any intercom. Or, you can single tap to end intercom with the first intercom friend, double tap to end intercom with the second intercom friend, and triple tap to end intercom with the third intercom friend. is in progress, mobile phone connection is temporarily disconnected. 2. Start an intercom conversation with one of the two friends in your intercom group. 3. You (A) can call the second intercom friend (C) by double tapping the Jog Dial, or the second intercom friend (C) may join the intercom by making an intercom call to you (A). 1. Press and hold the Jog Dial for 1 second until you hear a beep to terminate all intercom connections. 2. Tap the Jog Dial to disconnect from your first intercom friend. Double tap the Jog Dial to disconnect from your second intercom friend. Multiple headsets are connected during multi-way intercom. With various signals interfering each other, the intercom distance of multi-way intercom is relatively shorter than that of two-way intercom. 1. During a mobile phone call, tap the Jog Dial to invite one of your intercom friends to the conversation. 2. To disconnect the intercom during a conference phone call, tap the Jog Dial. 3. To disconnect the mobile phone call during a conference phone call, press the Jog Dial for 2 seconds or tap the Phone Button. Universal Intercom allows you to have intercom conversations with users of non-Sena Bluetooth headsets. You can pair the headset with only one non-Sena headset at a time. The intercom distance depends on the performance of the Bluetooth headset to which it’s connected. 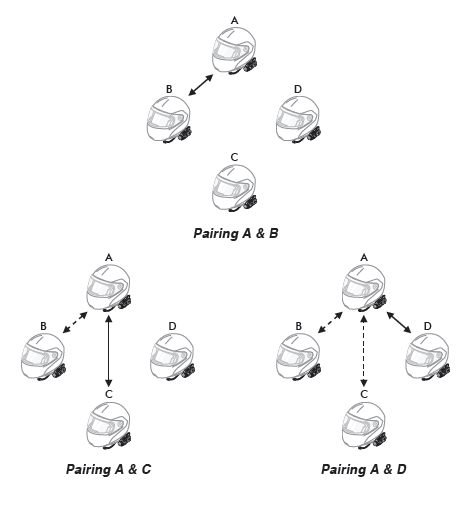 When a non-Sena Bluetooth headset is paired with the headset, if another Bluetooth device is paired via Second Mobile Phone Pairing, it will be disconnected. 1. Press and hold the Jog Dial for 10 seconds to enter the headset configuration menu. Rotate the Jog Dial until you hear a voice prompt, “Universal intercom pairing”. Tap the Phone Button to enter into Universal Intercom Pairing mode and you will hear multiple beeps. 2. Put the non-Sena Bluetooth headset in Pairing Mode. The headset will automatically pair with a non-Sena Bluetooth headset. 3. You can have a two-way intercom or multi-way intercom communication with up to three intercom friends using non-Sena headset. To turn on or off the FM radio, press and hold the Phone Button for 1 seconds until you hear a mid-toned double beep sound. You can listen to preset stations while listening to the FM radio. Tap the Phone Button once to go upward to your next saved preset station. The temporary station preset feature automatically finds and saves the nearest 10 radio stations without changing your existing preset stations. 1. Tap the Phone Button 3 times to automatically scan for 10 temporary preset stations. 2. The temporary preset stations will be cleared when the headset is powered off. You can select the proper FM frequency region from the Sena Device Manager. With the region setting, you may optimize the seek function to avoid unnecessary frequency ranges. 1. Double tap the Phone Button. 3. To save a station while scanning frequencies, tap the Phone Button when at that station. You will hear a voice prompt, “Save preset (#)”. The station will be saved as the next preset number. 1. Rotate while pressing the Jog Dial clockwise or counter clockwise. 2. To save the current station, press and hold the Jog Dial for 1 second until you hear a voice prompt, “Preset (#)”. 4. To save the current station, tap the Jog Dial again. You will then hear a voice prompt, “Save preset (#)”. 5. To delete the saved station in the preset number, tap the Phone Button. You will then hear a voice prompt “Delete preset (#)”. 1. 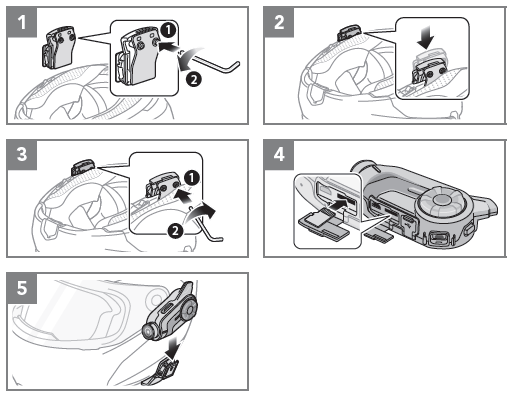 Locate the pinhole reset button at the back of the headset main unit. 1. To enter into camera configuration menu, press and hold the Camera Button for 5 seconds until you hear a voice prompt, “Camera setup”. 2. Rotate the Jog Dial clockwise or counter clockwise to navigate between the menus. You will hear voice prompts for each menu item as below. 3. You can enable or disable a feature, or execute a command by tapping the Phone Button. You can select the video mode to be normal recording mode, timelapse mode, or loop recording mode. Timelapse mode records series of photos at timed intervals and makes it into a video. Loop recording mode constantly records videos at timed intervals, replacing old video files when memory is full. You can select the video resolution to be 1440p/30fps, 1080p/60fps, or 1080p/30fps. You can select the timelapse interval to be either 1 second or 10 seconds. You can select the microphone gain for video recording to be low, medium, or high. You can record or hide date caption during video recording. If you select on, the date caption will be displayed on top of your recorded video. If you select off, the date caption will not be shown on your recorded video. Recording. Turn on the Speaker Sound Recording setting if you want to record music and intercom conversations on your video. 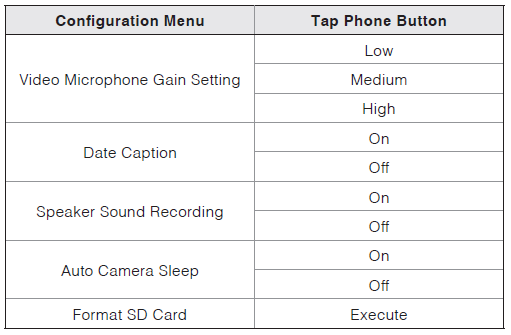 Turn off this setting if you want to record your voice only. You can set the camera to automatically power off after 5 minutes of inactivity. This feature does not work while charging the camera. SD card format will remove all files from a microSD card. When you use a new card for the first time, always format it before using the camera. You can change the settings of the headset through the Sena Device Manager or the Sena Utility App. speaking during an intercom conversation or a phone call. Radio Data System (RDS) Alternative Frequency (AF) Setting allows a receiver to re-tune to the second frequency location when the first signal becomes too weak. With RDS AF enabled on the receiver, a radio station with more than one frequency can be used. You can disable voice prompts by software configuration setting, but the following voice prompts are always on. HD Intercom enhances the two-way intercom audio from normal quality to HD quality. HD Intercom will become temporarily disabled when you enter into a multi-way intercom. If this feature is disabled, the two-way intercom audio will change to normal quality. The intercom distance of HD Intercom is relatively shorter than that of normal intercom. If this feature is enabled, you can initiate an intercom conversation with the last connected intercom friend by voice. When you want to start intercom, say a word such as “Hello” loudly or blow air into the microphone. If you start an intercom conversation by voice, the intercom terminates automatically when you and your intercom friend remain silent for 20 seconds. However, if you manually start an intercom conversation by tapping the Jog Dial, you have to terminate the intercom conversation manually. However, if you start intercom by voice and end it manually by tapping the Jog Dial, you will not be able to start intercom by voice temporarily. In this case, you have to tap the Jog Dial to restart the intercom. This is to prevent repeated unintentional intercom connections by strong wind noise. After rebooting the headset, you can start intercom by voice again. Enabling Audio Boost increases the overall maximum volume. Disabling Audio Boost reduces the overall maximum volume, but delivers more balanced sound. Assign phone numbers for speed dialing to make a phone call quickly. 2. Rotate the Jog Dial clockwise or counter clockwise to navigate between the menus. You will hear voice prompts for each menu item. You can adjust the angle for taking photos or recording videos. 1. You can rotate the vertical angle by 360º. 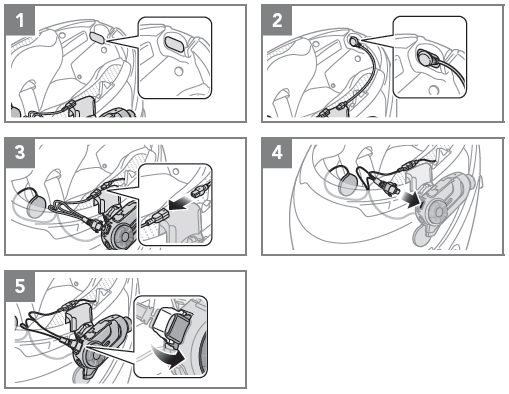 Loosen the wheel next to the main unit and rotate the main unit to set the desired angle. Tighten the wheel to lock it into position. 2. You can rotate the horizontal angle by 30º. Open the cover of the lens and rotate the lens to set the desired angle. The red tip of the lens should be perpendicular to the ground. 1. Loosen the two screws on the back plate of the clamp unit with the included allen wrench. 2. Insert the back plate of the clamp unit between the internal padding and external shell of the left side of the helmet. 3. Tighten the two screws until the clamp unit is fastened firmly to the helmet. 4. Insert a microSD card into the card slot to use camera. 5. Attach the main unit to the clamp unit until you hear a click. 1. Attach adhesive tape of the glued surface mounting plate to the helmet. 2. Make sure that the glued surface mounting plate sticks on the helmet firmly. Maximum adhesion occurs after 24 hours. 3. Attach the main unit to the glued surface mounting plate until you hear a click. 1. Attach the hook and loop fasteners for speakers to ear pockets inside the helmet. 2. 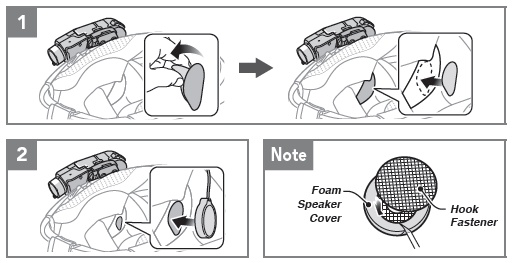 Attach the speakers to the hook and loop fasteners for speakers inside the helmet. 1. If the helmet has deep ear pockets, you can use the speaker pads to bring the speakers closer to your ears. they are slightly touching your ears. 1. Attach the hook and loop fastener for attachable boom microphone on the inside surface of the left external shell. 2. Attach the attachable boom microphone’s mounting plate to the hook and loop fastener. 3. Adjust the head of the microphone so that the tab is facing away from your mouth. 4. Align the arrows on the microphone and speaker cables and insert the microphone cable into the speaker cable. 5. Insert the speaker connector into the speaker port to connect it to the main unit. 6. Close the cover of the speaker cable to lock the cable to the port. You can use the boom microphone holder after attaching the hook and loop fastener for boom microphone holder on it to ensure secure installation. 1. Attach the included hook and loop fastener for wired microphone to the inside of the helmet’s chin guard. 2. Attach the wired microphone to the hook and loop fastener for wired microphone. 3. Align the arrows on the microphone and speaker cables and insert the microphone cable into the speaker cable. 4. Insert the speaker connector into the speaker port to connect it to the main unit. When you power on the headset, keep pressing the Jog Dial and the Phone Button simultaneously for about 5 seconds until you hear high tone triple beeps. Then you will hear a voice prompt indicating the battery level is high, medium, or low. You can see a live preview from the camera, manage recorded videos as well as configure the video settings using the built-in WiFi feature. When the camera and the Sena Camera App are connected, the camera is synchronized with the smartphone’s date and time. Download the Sena Camera App for Android and Apple operating systems from sena.com/camera-app. You can upgrade the headset’s firmware and configure its settings directly from your PC or Apple computer. Download the Sena Device Manager, please visit sena.com. You can configure its settings directly from your smartphone. Download the Sena Smartphone App for Android or Apple operating systems from sena.com/headset-app. The headset supports firmware upgrades. You can update the firmware using the Sena Device Manager. Please visit Sena Bluetooth website at www.sena.com to check the latest software downloads. You can remotely control the headset using Sena Remote Control devices (sold separately). 1. Turn on the headset and the Remote Control device. 2. Execute Remote Control Pairing in the configuration menu. 3. Enter pairing mode in the Remote Control device. 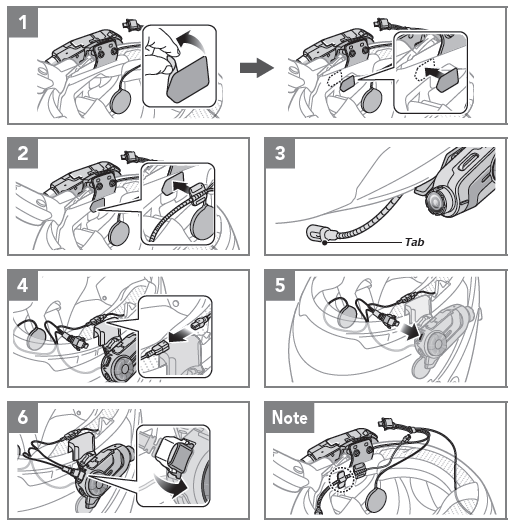 The headset will automatically connect with the Remote Control device in pairing mode.